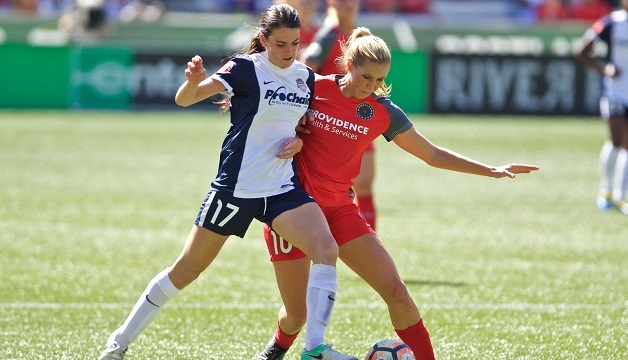 Portland, Oregon (Sept. 2, 2017) – On a sweltering afternoon in the Pacific Northwest, the Washington Spirit fell 4-0 to Portland Thorns FC in front of a crowd of 19,141 fans at Providence Park. Denmark international Nadia Nadim opened the scoring in the 22nd minute for Portland, recovering the loose ball following an initial penalty kick save by Spirit goalkeeper DiDi Haracic. Despite making a diving save moving to her left on Nadim’s PK attempt, Haracic did not have time to recover as the deflected ball fell to Nadim’s feet in the center of the box, allowing her to slot home a right-footed shot into the middle of the net. Canadian international Christine Sinclair doubled Portland’s lead in the 25th minute, connecting on a close range shot from the left side of the box on an assist from Nadim. A pair of U.S. Women’s National Team defenders linked up for Thorns FC on the third score of the game in the 40th minute. Meghan Klingenberg sent a corner kick into the box to set up an Emily Sonnett header, struck from the left side of the six yard box and landing in the bottom right corner of the net. Washington’s defense held Portland off the board for the majority of the second half, until the 81st minute when Sinclair struck the net again on a point blank shot assisted by Sonnett. The Spirit racked up 13 total shots in the game, including five on target, but Thorns keeper Adrianna Franch managed to convert on all five of her save opportunities. Meggie Dougherty Howard, Tori Huster, Mallory Pugh, Cheyna Williams and Shelina Zadorsky each put one shot on goal for the Spirit, while Huster led the team with 42 total passes, 32 of which came on the attacking side of the field. After entering the game as a second half substitute, defender Kassey Kallman racked up a team-high four clearances, and led Washington with an 88.2 percent passing accuracy rating. Washington will travel to New Jersey to go up against Sky Blue FC for a third and final time this season next Sunday, September 10. The Spirit will host the Boston Breakers on September 23 and Seattle Reign FC on September 30 at the Maryland SoccerPlex to finish the 2017 NWSL season. For tickets, visit Tickets.WashingtonSpirit.com. VENUE: Providence Park; Portland, Ore.